The continental hydrological cycle is one of the least understood components of the climate system. The understanding of the different processes involved is important in the fields of hydrology and meteorology. In this volume the main applications for continental hydrology are presented, including the characterization of the states of continental surfaces (water state, snow cover, etc.) using active and passive remote sensing, monitoring the Antarctic ice sheet and land water surface heights using radar altimetry, the characterization of redistributions of water masses using the GRACE mission, the potential of GNSS-R technology in hydrology, and remote sensing data assimilation in hydrological models. This book, part of a set of six volumes, has been produced by scientists who are internationally renowned in their fields. It is addressed to students (engineers, Masters, PhD) , engineers and scientists, specialists in remote sensing applied to hydrology. Through this pedagogical work, the authors contribute to breaking down the barriers that hinder the use of Earth observation data. Nicolas Baghdadi is Research Director at IRSTEA in France. He is currently the scientific director of the French Land Data Centre (Theia). Mehrez Zribi is a Director of Research in CNRS/France. Since October 2008, he has been with the Centre d’Etudes Spatiales de la Biosphère, Toulouse. His research interests include land surface characterization for hydrology applications, remote sensing signal processing, and airborne microwave instrumentation. 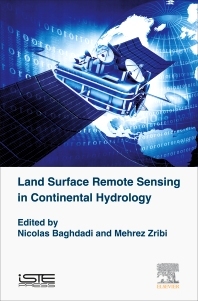 Mehrez Zribi has published actively in peer-reviewed journals and has coordinated publication of 20 books about remote sensing for land surfaces. He is responsible for the observation systems and radar teams at theCESBIO laboratory.